Orthodontic emergencies can be classified as urgent problems relating to the maintenance of orthodontic appliances, or excessive pain caused by orthodontic appliances. General dental practitioners should be able to manage orthodontic emergencies, including referral to an orthodontist when necessary. Removable active appliance is used by dentist to tip teeth using screws, springs and bows of various types to correct malocclusion. The appliance can be taken out for cleaning and for adjustments made by orthodontists. If the appliance is loose in an emergency situation, the dentist can adjust the retentive component of the appliance to increase the retention of the appliance by using Adams pliers. Suppose the appliance breaks, the orthodontist should be alerted as soon as possible. The wearer should not use the appliance as it could cause trauma and could pose a significant risk of airway obstruction if the wearer accidentally inhales. There are many components to the fixed appliance, which have a potential to break off if the patient chews on hard or crunchy food. Wearers should wear a mouth guard over the appliance if when playing contact sports. 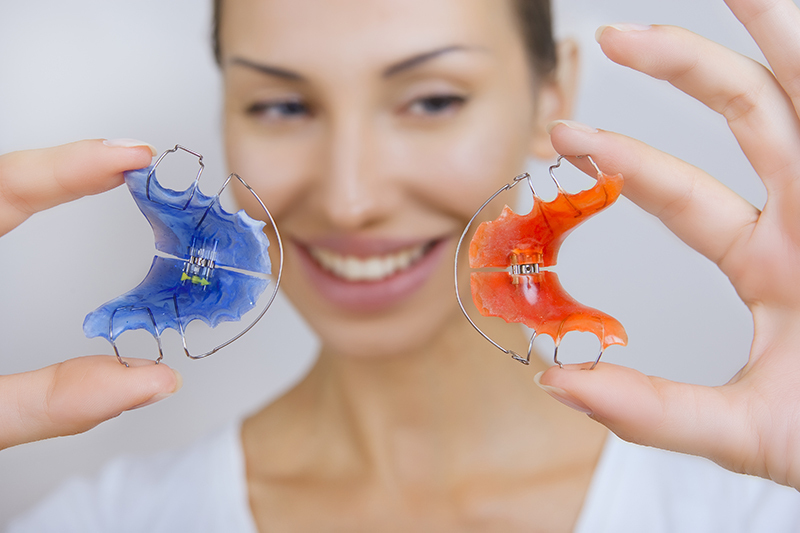 If one of the components is loose or comes off, the user must call the orthodontist right away. If the component is loose the dentist as an emergency treatment can cover the component with orthodontic relief wax. If the component breaks off, then the dentist can use a pair of tweezers to remove it making sure to protect the airway at all times. Ligatures are small elastics or wires, which aim to secure the arch wire firmly within the brackets on the teeth. If a ligature becomes loose or lost, this can render the appliance less effective as the forces on that particular tooth are reduced. In this case, loose elastic can be re-positioned with tweezers, ideally by an orthodontist however general dental practitioners are also able to do so. If a wire ligature becomes loose, it should be secured or replaced only by a trained orthodontist and in the meantime, if causing irritation, orthodontic relief wax should be used over any sharp ends. The patient should avoid replacing the wire ligature them if it is lost and should seek an appointment with their orthodontist. Separators, also known as orthodontic spacers, are usually placed between posterior teeth to open up contact point prior to placing metal orthodontic bands. The separators should ideally be kept in place until the patient’s next appointment in order for the orthodontic band to fit. If the separator is lost, the orthodontist should be informed and he/she can advise for a next appointment for the patient. The arch wire in fixed orthodontic appliances should be flat against the tooth, however if the wire is protruding it can cause irritation to the surrounding soft tissues. Wire benders or a dental flat plastic can be used to bend the wire into place, or if this is not possible, the protruding wire can be covered with wax. If there are significant problems, the wire can be clipped using distal end cutters, being careful to avoid inhaling or ingesting wire fragments. As a last resort measure, the whole wire and ligatures can be removed. De-bonded brackets, if left untreated, can result in irritation of lip and cheek in short term. If a bracket de-bonds from the tooth, the de-bonded bracket can be removed from the arch wire by initially removing the ligature holding it in place. Alternatively, orthodontic wax relief can be used to secure the de-bonded bracket to the adjacent bracket as a temporary measure to prevent irritation of lip and cheek. However, it is essential to inform the orthodontist as soon as possible so that appropriate actions are taken to address the de-bonded brackets immediately.